Shealyn Prouflias (#11) earned Athlete of the Month Honors for February representing the Lady Knights Basketball team. 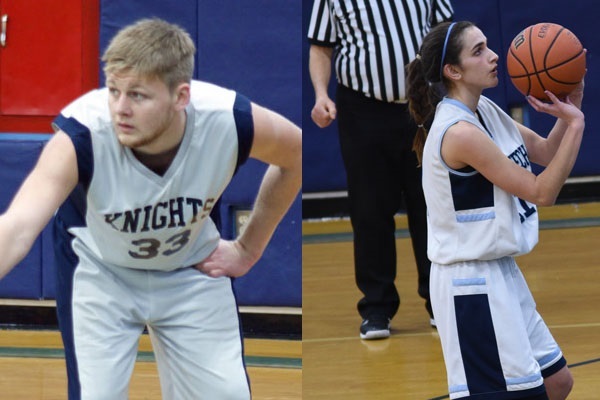 Prouflias wrapped up her historic career in February playing in her final game for the Knights. The senior guard tallied 89 points during the month and also notched her 1,000th career point during a home game against Notre Dame on February 12th. Prouflias became only the second Lady Knights basketball player to reach the milestone. Prouflias served this season as a Senior Captain and earned her fourth straight Most Valuable Player award. Derek has been playing inspired basketball this year. He never quits and his continuous focus is on winning. He is one of our best defenders and has shown his play making ability this month. He has a great work ethic and one of the best players we have had in the program in terms of heart, desire, and winning attitude.